Cryptocurrency mining especially proof of work can be analysed from a pure micro-economical point of view. First of all, the market is about transaction validation. 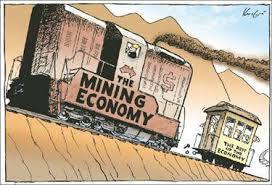 The mining economy is split into two parts: the miners provide the supply for transaction validation. Other actors, like users, merchants, exchange services that send transaction into the system provide the demand for transactions. It started somehow in a way that everyone could run mining on a simple laptop, implying practically a perfect competition between suppliers with minimal fix costs and entry barriers. As the hardware requirements developed further the fix costs of the miners were getting bigger and bigger, implying centralization efforts which was manifested for example in the appearance of mining pools. It means that the transaction validation market moved from the perfect competition to the monopoly direction, having at the moment somewhere at the stage of oligopoly. In this sense we might as well define centralization and decentralization in the sense of market structure, meaning that in a total decentralized application the transactions of the application are executed on a supplier market that is globally distributed and is in the state of perfect competition. Does Cryptocurrency mean the end of Fiat money ?